Showing results for tags 'xj'. Wiring running lights on a 97 xj swap! Well I need some help figuring out how to wire these running lights... I have a 1990 mj that I am about 90% done with a 97 swap just basically buttoning up all the small issues now. I have the drive train and dash with harnesses out of a 2001 xj I left my mj rear harness and have been plugging wires figuring out what goes to what and have narrowed the majority of it all down I have my stop lights reverse lights brake lights and turn signals but for the life of me I can’t seem to figure out how to wire these damn running lights from the 2001 dash harness to the rear mj harness I wish now I would have just ran the xj harness back I feel as if it would have been less headache but yet here I am I know the mj “running lights” are the blue wire on the oval connecter and the br/YL wire coming off the xj dash harness is the equivalent to the xjs running lights but how is it supposed to be wired I tried running it off of the drivers and pass her sides but it just keeps popping fuses I need help! Pics of the truck where it started and where I’m at! HI I am new to this community but not to Jeep forums. I tried being active on Cherokee Forum, but I decided to not spend too much on my XJ. I daily drive an XJ and used to want to build it up. However I have always loved the MJ platform and that was what I wanted in the first place. Well I officially got the title to a 1991 Jeep Comanche I bought at the end of January. So it is official and I can dump money in it and start a build thread. I bought it mainly for being a straight body with no rust. It will be a long project but hopefully done by the end of the year. Going to look at a 99 XJ to buy not running. I am going to look at a XJ that is for sale. I talked with the owner and he can't afford to pay the mechanic to work on it anymore so he is cutting his losses and buying another car. He has owned it for 4 years and three weeks ago it started blowing fuel pump fuses. He kept replacing them and then it eventually quite blowing them. It still would not start so he took it to mechanic. The mechanic found motor oil in the PCM?? Ya weird he was baffled to because he said the engine has no major oil leaks. So they replaced it with a junkyard PCM and still no spark or fuel. They replaced CPS and still nothing. He said that's all he could afford and the mechanic said it maybe another sensor that is to blame. The mechanic has checked the wiring harness and found no issues with it. Any other sensor that would cause no fuel or spark? Any ideas or what to look for when I go to check it out? 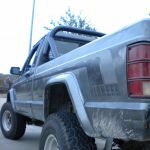 I'm in search for solid vent/ wing windows for my jeep comanche. My current moveable vent/ wing windows leak. I'm willing to trade or sell my moveable windows for a solid. PM me if you are interested in helping me! Bed swap questions and advice. So, as some of you know, my MJ has a utility bed on it currently. Found out that it is partially welded to the frame, which is lame. Pics are in my build thread. I have a standard MJ bed on my project that I want to swap on, most likely. Or might even consider a flatbed of sorts. Anyways, for those of you who have done flat bed or other bed type swaps, what did you do for fuel tank mounting. I was thinking maybe just a couple pieces of steel running across the frame from side to side. Even if I swap a factory bed, I think it will make things easier overall. Thoughts, concerns, or constructive criticism? Thank you. Installing XJ handbrake in a short bed MJ cable length? So its been done before but theres no clear guide that i can see that tells you what length cables you need for a handbrake setup compared to the foot brake. Anybody know a good match for a short bed? Removing Factory Integrated Xj Trailer Hitch, How? Does anybody have any insight or experience removing the factory, integrated trailer hitch from an '88 XJ? It's the kind that bolts to the rear bumper, in addition to the frame rails (see below). I want to put a standard 2" Reese hitch and use a drop shank to accommodate my lift, but I'm kind of stumped on how to remove this one.